Merry Wyatt’s father has a dying wish – to see his daughter married. 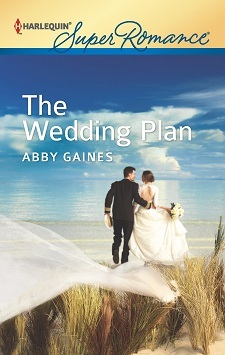 It takes some coercion on Merry’s part, but she convinces her childhood friend, Navy hero Lucas Calder, to tie the knot on a strictly temporary basis. But when her dad begins to recover, their plans for a quickie divorce are stymied. Lucas and Merry are stuck in a marriage neither of them wanted…did they? Despite their “newlywed” pretense, Merry knows better than to fall in love—her husband might be a navy hero, but he’s a “leaver”, not the “stayer” she needs. A real hero is someone who stays, and true courage means sticking around—Merry won’t take a chance on anything less. Lucas Calder had spent the past eight years flying his chopper in places where no one spoke a language he recognized. But the hand signals and smiles of Afghani kids had been easier to understand than the scene he was witnessing now. His father, Admiral Dwight Calder—famously rigid, gimlet-eyed, and about as warm as a midnight watch on an aircraft carrier in the Arctic—blew a raspberry on the tummy of his baby daughter, Lucas’s half-sister, lying on her changing table. Incomprehensible. And right now, damn inconvenient. Lucas glanced at his watch. Three p.m. Ten p.m. in the Gulf. He should sitting at the tiny desk in his cabin, processing the next day’s minesweeping flight plan, imprinting it on his memory. “Who’s a smelly girl?” Dwight teased Mia. She shrieked with delight, apparently undisturbed by the aroma emanating from her diaper. “Dad, can we talk?” Lucas tried again to drag his dad’s attention to more serious matters. Such as Lucas’s down-the-toilet military career. “Of course we can.” Dwight untaped the diaper. “Don’t talk about your sister like that.” Dwight wielded a wet-wipe with surprising efficiency. It went without saying that he hadn’t done any diaper changing when Lucas and his older brother Garrett were babies. Their father’s metamorphosis to doting dad was very new. For Mia’s sake—she was a cute kid, as kids went—Lucas was pleased. He just wished it was possible to get a word out of Dwight that wasn’t about feeding or potty-time. As Dwight tossed the diaper in the trash, Mia wriggled, a flurry of pudgy arms and legs. Lucas surged forward to block the side of the changing table. Dwight held Mia in place with a hand on her chest. “I wouldn’t let her fall,” he growled. Lucas hadn’t come back to New London, Connecticut, to argue with his dad. He stepped away. “Pass me a new diaper,” his father ordered. The return to something approaching military style, a language Lucas could understand, was so welcome that he obeyed. When Mia was encased in the fresh diaper, Dwight picked her up. “Would you like to hold her?” he asked Lucas. Mia nestled against Dwight’s shoulder, eyelids at half-mast. “She kept calling to me over the baby monitor,” Dwight protested. Lucas noted with some discomfort that his father sounded sheepish. Great. The free world had benefited for decades from Admiral Calder’s unrelenting sense of mission, but the one time Lucas needed his dad operating at full aggression… What had happened to Admiral Coldass, as he’d been irreverently known to his crew? Mia garbled something that may or may not have been an attempt at words. Her parents cooed as if she’d just recited from Shakespeare. Lucas couldn’t help noticing that Dwight caressed his wife’s bottom as she passed. Things really had changed. Was his dad even capable of focusing on Lucas’s problem? Lucas reminded himself Dwight had been a Navy man far longer than he’d been a family man. If he could just recall his “pre-enlightened” state, he would understand why Lucas needed his help. “Fine,” Lucas said. “Great. Fully recovered.” Sixteen months ago, his minesweeping chopper had been shot down in the Persian Gulf. Lucas had been medevac-ed to the U.S.A. for treatment—on the day Mia was born, as it turned out. Getting over the deep concussion, broken ribs and ankle, and punctured lung had proven easy. Or so he’d thought at the time. The surgery on his shattered hand had been more complex, the rehabilitation endless. Partly because Lucas had insisted on doing it all in one long stretch—he’d relocated to Baltimore to live right by the rehab center. “Shame about your eyes.” Dwight must have seen Lucas’s medical records. Shouldn’t happen, of course, but Admiral Calder had so many friends in high places, there was always someone keen to fill him in about his son. Even though Dwight would have been too honorable to ask. “The only problem was my depth perception,” Lucas said. “Everything else was fine.” He’d had no idea that, after working so hard to restore his hand, he would fail his back-to-duty physical because of his eyesight. The doctor had attributed the change in his vision to the deep concussion he’d sustained in the crash. It was an insurmountable problem. “I want to fly.” They’d told him that couldn’t happen. He should have known better than to issue an ultimatum to the U.S. Navy. But no way did he want to sit at a desk while, out there, men risked their lives to protect others. Thanks to his ultimatum—send me back, or discharge me—he’d be out at the end of the year. A man without a mission. He couldn’t get his head around the idea. Hopefully, he wouldn’t have to. “You failed the physical, you can’t fly,” his father said. Mostly, Lucas considered having his father so high-up in the navy to be a disadvantage. Today, he hoped that for the first time in his life, it would help. Someone who would understand his need to get back out there. Another pilot had been assigned to Lucas’s chopper on a temporary basis on the assumption that he’d be back. Now that he was out, his C.O. wanted to appoint the other guy permanently. At Lucas’s request, he’d agreed to hold off for a few more weeks. Seemed he had more faith in Lucas’s ability to swing a retest than his dad did. Change wasn’t always a good thing. Merry Wyatt was the daughter of John Wyatt, retired navy lieutenant and Dwight’s best friend. John and Dwight had served in Vietnam together, on a submarine, back when they were practically still kids. John had saved Dwight’s life. Which Lucas assumed was why his unsentimental father had always shared John’s desire to see Lucas and Merry’s childhood friendship evolve into a romantic attachment. He and Merry had humored their dads by dating once a year for the past, what, nine years? Yeah, nine, starting right after Merry graduated high school. That first date had been a disaster, but some of the others had been…interesting. Over the years, each of them had used their on-again, off-again “romance” to their own advantage. Like the year Lucas had claimed a back-home girlfriend as an excuse to refuse the attentions of his captain’s daughter without offending the captain. Their last date, six months ago in Baltimore, was responsible for the recent radio silence he and Merry had been observing. Sooner or later, they had to get their first encounter since what happened in Baltimore out of the way. Might as well be now. Merry was the forgiving type…wasn’t she? She’s a romantic. An idealist. Idealists are quick to forgive. An appeal against medical disqualification would require Dwight to pull strings. Something he had an aversion to. “Until you’ve thought about it,” Lucas said.